In one of my many posts yesterday I noted that I was taking some profit around 1.2860 on my intraday shorts from 1.2900+ and that has proved prudent. Another couple of tests down there and indeed a rally to 1.2900 has meant the 1.2850-00 range has remained intact on a combo of a roller-coaster EURGBP and softer USD. I will continue to keep playing that range from the short side adding to fresh shorts up here on any further rally into 1.2920, but equally there's been pips to be had buying the dips too ofc. USD woes need to be respected in the current mix but if USDJPY starts to slide we should expect some GBPJPY supply too and help cap GBPUSD. Well that's the theory at least! Great two-way markets for jobbers. What's not to like ? In our live forex analysis NZDJPY below is our pair’s weekly chart. 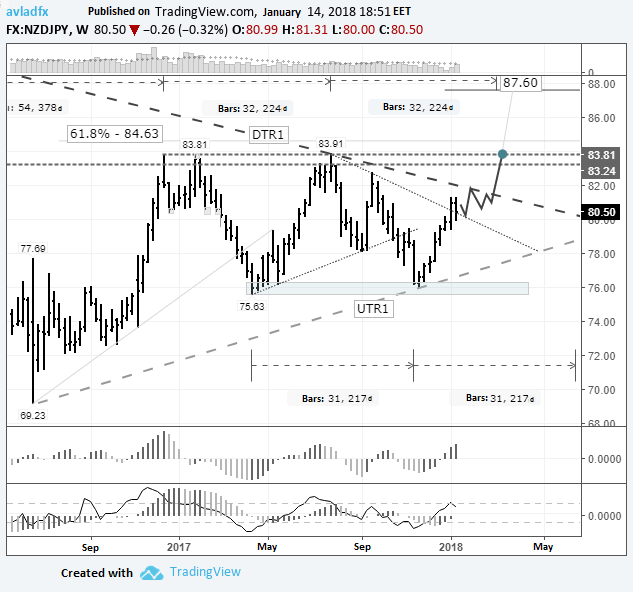 It’s been in a sideways trend since the beginning of 2017, with a range of 75.63 – 83.81 (818 pips). In the last 7 weeks, the New Zealand dollar has risen against its US counterpart from 76.09 to 81.31. Buyers are propping the price up at the upper boundary of this range. The Bank of Japan favours a loose monetary policy, so this upwards trend should continue during the 1st quarter. This growth can be broken down into two phases. First, growth up to the DTR1 at 81.73. Secondly, after the breakout of DTR1, growth to 83.31. Once the pair exits the sideways trend, we can consider the possibility of a surge on the Kiwi dollar to 87.60.